Inclusive, warm and welcoming were all essential themes in creating BPX Energy's Denver office which features a 52-foot-long table made from a single tree, a giant communal hammock and other collaborative social spaces. Stantec has created a a workplace that feels like home for BPX Energy, a division of BP, located in Denver, Colorado. When BP Lower 48 was looking for a new headquarters close to its growing onshore gas and oil business in the Rocky Mountains, Denver was an easy choice. The mission was to design a workplace that also feels like home. The new, 138,000-square-foot office space, designed by Stantec’s buildings group in Denver, incorporates the latest in workplace design with a focus on creating an inclusive, warm and welcoming office. The office includes 240 offices constructed out of glass demountable partitions, which include floor-to-ceiling windows providing views of the Platte River and the downtown skyline. Each employee has their own personal office space, with glass walls allowing for connectivity and transparency. Offices are grouped in 4-office clusters, with breakout space between offices. The Unity Café is a large cafeteria space with a 52-foot-long table created from a single tree. The tree was salvaged from a Steamboat Springs farm after it was destroyed in a lightning strike. The Base is a ground-floor gathering space with moveable glass walls that open to views of the Platte River featuring a bar-top seating area, custom-made aspen canopy, a huge media wall, fireplace, and ping-pong tables that convert to conventional tables for meetings or dining. The Nest is a two-story gathering space that meshes the work/social environment. Netting creates a “giant hammock” between the third and fourth floors, while large swings provide a hangout or comfortable work space. 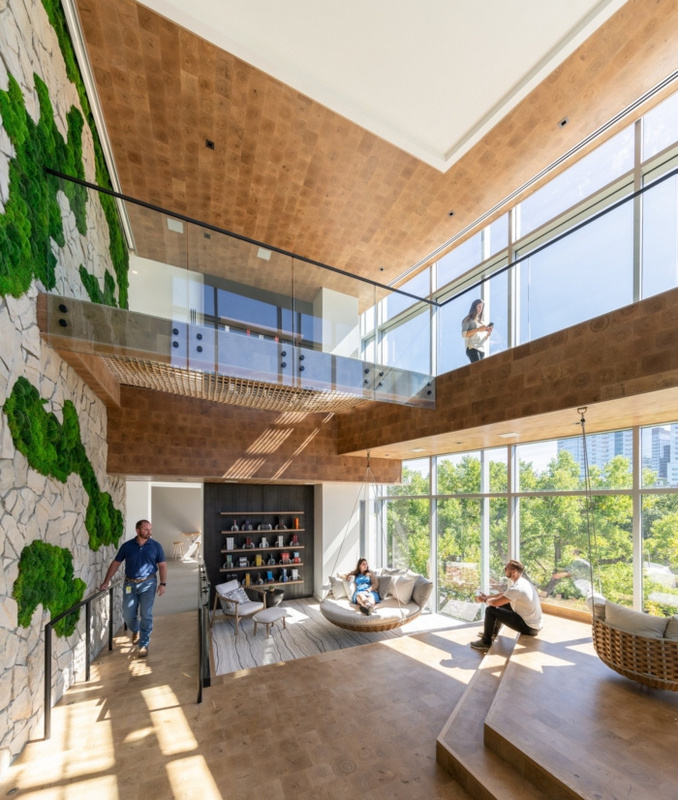 A moss wall and floor-to-ceiling windows create a unique indoor/outdoor working space. Another feature is a three-story “X” staircase modeled after drilling rigs used in the oil and gas industry, emphasizing the company’s business, while offering an inspirational alternative to the elevator.